Azospirillum biofertilizers have a history going back to the beginning of the XXth However, researches still have to find new and competitive strains and improve biofertilizers production and application techniques. They are one of te most used biofertilizers in organic farming. The present paper review and analyses the development of the new agriculture using such microorganism, and showing not only the biofertilization effect but some biocontrol properties of the presented strains. The products containing Azospirillum strains and their use begin to play an important role in modern agriculture and in special in some countries in course of development as an alternative to chemical expensive and some time not environmental friendly products. Countries from Asia, South America, use it in huge quantities. In developed area of the lobe, there are only some tiny initiative, mainly because the multinational companies, and because of the legislation in use. 2. Ardakani M.R., Mazaheri D., Mafakheri S., Moghaddam A. (2011) Absorption efficiency of N, P, K through triple inoculation of wheat (Triticum aestivum L.) by Azospirillum brasilense, Streptomyces sp., Glomus intraradices and manure application Physiol. Mol. Biol. Plants;17(2):181â€“192. 3. Arzanesh M.H., Alikhani H.A., Khavazi H.K.A., Miransari R.M. (2011) Wheat (Triticum aestivum L.) growth enhancement by Azospirillum sp. under drought stress, World J Microbiol Biotechnol; 27:197â€“205. 4. Bashan Y, de Bashan L:E, (2010) How the Plant Growth Promoting Bacterium Azospirillum Promotes Plant Growth-A Critical Assessment. In Advances in Agronomy 18: 77-136. 5. Bashan Y, de Bashan L.E. (2015) Inoculant preparation and Formulations for Azospirillum spp.Chapter 26 in Cassan FD et al, (eds) Handbook for Azospirillum Springer Ed, Switzerland., 2015 . 6. Bashan Y., Trejo A., de-Bashan L.E. (2011) Development of two culture media for mass cultivation of Azospirillum spp. and for production of inoculants to enhance plant growth Biol Fertil Soils;47:963â€“969. 7. Barassi C.A., Ayrault G., Creus C.M., Sueldo R.J., Sobrero M.T. (2006) Seed inoculation with Azospirillum mitigates NaCl effects on lettuce. Scientia Horticulturae;109 8â€“14. 8. Barea JM., AzcÃ³n R., AzcÃ³n-Aguilar C, Mycorrhizal Fungi and Plant Growth Promoting Rhizobacteria in: Plant Surface Microbiology pp 351-371. 9.	de-Bashan L.E, Moreno M., Hernandez J.P., Bashan Y. (2002) Removal of ammonium and phosphorus ions from synthetic wastewater by the microalgae Chlorella vulgaris co-immobilized in alginate beads with the microalgae growth-promoting bacterium Azospirillum brasilense. Water Research; 36:2941â€“2948. 11. Beijerinck M.W. :(1925) Ãœber ein Spirillum, welches frei ein Stickstoff binden kann? Zentralblatt fÃ¼r Bakteriologie, Parasitenkunde, Infektionskrankheiten und Hygiene. Abteilung II; 63, 353-359. 12. Bellone CH, de Bellone Silvia C. (2012) Interaction of Azospirillum brasilense and Glomus intrarradix in Sugar Cane Roots Indian J Microbiol; 52(1):70â€“75. 13. Ben-Dekhil S., Cahill M., Stackebrandt E., Sly L.I. : (1997) Transfer of Conglomeromonas largomobilis subsp. largomobilis to the genus Azospirillum as Azospirillum largomobile comb. nov., and elevation of Conglomeromonas largomobilis subsp. parooensis to the new type species of Conglomeromonas, Conglomeromonas parooensis sp. nov. Syst. Appl. Microbiol. ; 20:72-77. 14. Bullion A., Winder J. (2016) Biofertilizers set to see increased global crop coveragehttps://iegpolicy.agribusinessintelligence.informa.com/PL040401/Biofertilisers-set-to-see-increased-global-crop-coverage. 15. Caballero-Mellado J., Lopez-Reyes L., Bustillos-Cristales R. (1999) Presence of 16S rRNA genes in multiple replicons in Azospirillum brasilense. FEMS Microbiol. Lett. ;178:283â€“288..
18. CassÃ¡n F., Vanderleyden J., Spaepen S. (2014) Physiological and Agronomical Aspects of Phytohormone Production by Model Plant-Growth-Promoting Rhizobacteria (PGPR) Belonging to the Genus Azospirillum Journal of Plant Growth Regulation; 33, (2):440-459. 21.	do Carmo Lana M, Dartora J., Marini D, Hann JE. (2012) Inoculation with Azospirillum, associated with nitrogen fertilization in maize Rev. Ceres, ViÃ§osa; 59(3):399-405. 22. Constantino M., Gomez-Alvarez R., Alvarez-SolÄ±s J. D., Geissen V., Huerta E., Barba E (2008) Eï¬€ect of Inoculation with Rhizobacteria and Arbuscular Mycorrhizal Fungi on Growth and Yield of Capsicum chinense Jacquin. Journal of Agriculture and Rural Development in the Tropics and Subtropics 109 2,169â€“180. 23. Chamam A, Sanguin H, Bellvert F, Meiffren G, Comte G, Wisniewski-DyÃ© F, Bertrand C, Prigent-Combaret C. (2013) Plant secondary metabolite profiling evidences strain-dependent effect in the Azospirillum-Oryza sativa association. Phytochemistry.;87:65-77. 25.	del Amor F.M., Serrano-MartÄ±nez A., Fortea M.I., Legua P., Nunez-Delicado E (2008) The effect of plant-associative bacteria (Azospirillum and Pantoea) on the fruit quality of sweet pepper under limited nitrogen supply Scientia Horticulturae;117 191â€“196. 26. De Lucca e Brancini A., De Moraes Dan L, Piccini GG, Albrecht LP., Ortiz HT (2012) Seed inoculation with Azospirillum brasilense, associated with use of bioregulators in maize Revista Caatinga, MossorÃ³;25(2):58-64. 27. Dominguez-NuÃ±ez JA, MuÃ±oz, D., Planelles R,. Grau J. Artero M, F., Anriquez A, Albanesi A. (2012) Inoculation with Azospirillum brasilense enhances the quality of mesquite Prosopis juliflora seedlings Forest Systems; 21(3), 364-372. 28. Drogue, B., Sanguin, H., Borland, S., Prigent-Combaret, C. and Wisniewski-DyÃ©, F. (2014), Genome wide profiling of Azospirillum lipoferum 4B gene expression during interaction with rice roots. FEMS Microbiology Ecology;87:543â€“555. 31. Felici C, Vettori L, Giraldi E, Forino LMC, Toffanin A, Tagliasacchi AM, NUti M, Frache C, Lidstrom K, Elmerich C, ( 2009) Nitrogen fixing bacteria associated with leguminous and non- leguminous plants.Pl Soil. 321:35-39. 33. Ganapathy B.A., Salvagi V.P. (2006) Effect of Different Concentrations of Selected Micronutrients and their Combinations on Growth, IAA, GA and EPS Production in Azospirillum brasilense Karnataka J. Agric. Sci. ;19 (1):61-65. 34. Galazka A., Galazka R. (2015) Phytoremediation of Polycyclic Aromatic Hydrocarbons in Soils Artificially Polluted Using Plant-Associated-Endophytic Bacteria and Dactylis glomerata as the Bioremediation. Plant Polish Journal of Microbiology; 64 (3):241â€“252. 35. Guerrero-Molina MF, Winik B.C., Pedraza R.O. (2011) More than rhizosphere colonization of strawberry plants by Azospirillum brasilense Applied Soil Ecology ;61:205 â€“212. 37. Gowri MP., Srivastava S (1996) Encapsulation as a response of Azospirillum brazilense sp7 to zinc stress World Journal of Microbiology and Biotechnology;12(4):319â€“322 . 38.	lyas N., Bano A. (2010) Azospirillum strains isolated from roots and rhizosphere soil of wheat (Triticum aestivum L.) grown under different soil moisture conditions Biol Fertil Soils 46:393â€“406Higa T, Parr J. (1994) Beneficial and effective microorganisms for a sustainable agriculture and environment International Nature Farming Research Center Atami, Japan 1994 16 pp. 39. Hiltner L.1904. Uber neue erfahrungen und probleme auf dem gebiete der bodenbakteriologie. Arbeiten der Deutschen Landwirtschaft Gesellschaft98,59â€“78. 40. Hingole SS, Pathak AP, (2013) Report on efficient salt stable Azospirillum a Lonar Soda Lake isolate Science Research Reporter; 3(2):200-203. 41. Hossain M., Jahan I. (2015) Azospirillum as biofertilizer and Bangladesh perspective Banats Journal of Biotechnology, VI(11) DOI: 10.7904/2068â€“4738â€“VI (11)â€“69. 42. Isawa T, Yasuda M, Awazaki H, Minamisawa K, Shinozaki S, Nakashita H.(2010) Azospirillum sp. strain B510 enhances rice growth and yield. Microbes Environ. 2010;25(1):58-61. 43. Joe M., Sivakumaar (2010) Seed priming with co-flocs of Azospirillum and Pseudomonas for effective management of rice blast Archives of Phytopathology and Plant Protection 43,(16); 1551â€“1563. 44. 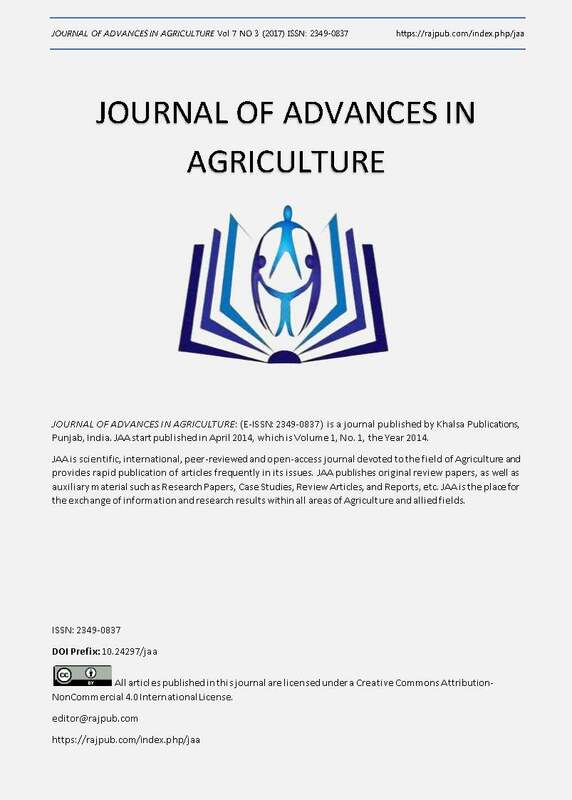 Joe M. Karthikeyan M.B, Sekar C, Deiveekasundaram M. (2010) Optimization of bioï¬‚oc production in Azospirillum brasilense (MTCC-125) and evaluation of its adherence with the roots of certain crops Indian J Microbiol; 50 (1):21â€“25. 45. Joe M.M., Jaleel C.A., Karpagavinayaka Sivakumar P., Zhao C.-X, Balathandayutham K. (2009) Co-aggregation in Azospirillum brasilensense MTCC-125 with other PGPR strains: Effect of physical and chemical factors and stress endurance ability Journal of the Taiwan Institute of Chemical Engineers 40:491â€“499. 46. Khammas K.M., Ageron E., Grimont P.A.D., Kaiser P.(1989) Azospirillum irakense sp. nov., a nitrogen-fixing bacterium associated with rice roots and rhizosphere soil. Res. Microbiol.,140: 679-693. 47. Kamenev AA., Tugarova AV, Tarantilis PA, Gardiner PHE, Polissiou MG (2012) Comparing poly-3-hydroxybutyrate accumulation in Azospirillum brasilense strains Sp7 and Sp245: The effects of copper(II) Applied Soil Ecology 61 (2012):213 â€“216. 48. Kaneko T, Minamisawa K, Isawa T, Nakatsukasa H, Mitsui H, Kawaharada Y, Nakamura Y, Watanabe A, Kawashima K, Ono A, Shimizu Y, Takahashi C, Minami C, Fujishiro T, Kohara M, Katoh M, Nakazaki N, Nakayama S, Yamada M, Tabata S, Sato S. (2010) Complete genomic structure of the cultivated rice endophyte Azospirillum sp B 510. DNA Research17(1):37-50. 49. Kanevskiya M.V, Konnova S.A, Boyko A.S.,Fedonenko Yu. P, Sigida E. N., Ignatova V. V.(2014) Glycopolymers of Azospirillum lipoferum Sp 59b Microbiology; 83. ( 1â€“2);15â€“22. 50. Kostov O, Lynch M. (1998) Composted sawdust as a carrierf or Bradyrhizobium, Rhizobium and Azospirillum in crop inoculation World Journal of Microbiology and Biotechnology; 14(3):389-397. 51. Kumaresan G., Reetha D. (2011) Survival of Azospirillum brasilense in liquid formulation amended with different chemical additives Journal of Phytology; 3(10): 48-51. 52. Lai W.A, Rekha P. D., Arun A. B., Young C.C. (2008) Effect of mineral fertilizer, pig manure, and Azospirillum rugosum on growth and nutrient contents of Lactuca sativa L. Biol. Fertil. Soils; 45:155â€“164. 53. Larraburu E.E., Llorente B.E.. (2015) Azospirillum brasilense enhances in vitro rhizogenesis of Handroanthus impetiginosus (pink lapacho) in different culture media. Annals of Forest Science, Springer Verlag/EDP Sciences; 72 (2):219-229. 54. Lavrinenko K., Chernousova E., Gridneva E., Dubinina G., Akimov V., Kuever J., Lysenko A., Grabovich M.:(2010) Azospirillum thiophilum sp. nov., a diazotrophic bacterium isolated from a sulfide spring. Int. J. Syst. Evol. Microbiol.;60:2832-2837. 55. Lin S.Y., Young C.C., Hupfer H., Siering C., Arun A.B., Chen W.M., Lai W.A., Shen F.T., Rekha P.D., Yassin A.F. (2009): Azospirillum picis sp. nov., isolated from discarded tar. Int. J. Syst. Evol. Microbiol. ; 59, 761-765. 56. Lin S.Y., Shen Fo-Ting, Young Li-Sen, Zhu Zhi-Long, Chen Wen-Ming, Young Chiu-Chung (2012) Azospirillum formosense sp. nov., a diazotroph from agricultural soil Int J Syst Evol Microbiol. ; 62:1185-1190. 58. Lin S. Y., Hameed A., Liu Y.C., Hsu Y.H., Lai, W.A., Shen F.T., Young C.C. (2015) Azospirillum soli sp. nov., a nitrogen-fixing species isolated from agricultural soil. Int. J. Syst. Evol. Microbiol.;65:4601-4607. 59. Lin S.Y., Liu Y.C., Hameed A., Hsu Y.H., Huang H.I., Lai W.A., Young C.C. (2016) Azospirillum agricola sp. nov., a nitrogen-fixing species isolated from cultivated soil. Int. J. Syst. Evol. Microbiol.;66:1453-1458. 60. Lopez da Silva A.L., Da Luz Costa J., Gollo AL., Dos Santos D.J., Forneck HR., Biasi LA., Soccoli VT, De Carvalho JC., Soccoli RC. (2014) Development of a vinasse culture medium for plant tissue culture. Pak. J. Bot. ;46 (6): 2195-2202. 62. Malhotra M., Srivastava S. (2008). An ipdC gene knock-out of Azospirillum brasilense strain SM and its implications on indole-3-acetic acid biosynthesis and plant growth promotion. Antonie Van Leeuwenhoek 93:425â€“433. 63. MalusÃ¡ E., Vassilev N. (2014) A contribution to set a legal framework for biofertilisers Appl Microbiol Biotechnol; 98:6599â€“6607. 66. Martin-Didonet C.C.G., Chubatsu L.S., Souza E.M., Kleina M., Rego F.G.M., Rigo L.U., Yates M.G., Pedrosa F.O. (2000) Genome structure of the genus Azospirillum. J. Bacteriol.;182:4113â€“4116. 67. Meenakshisundaram M., Santhaguru K., Rajenderan K. (2011) Effects of Bioinoculants on Quality Seedlings Production of Delonix Regia in Tropical Nursery Conditions Asian Journal of Biochemical and Pharmaceutical Research 1 (1) :98-107. 68. Mehdipour Moghaddam MJ, Emtiazi G.,Salehi Z (2012) Enhanced Auxin Production by Azospirillum Pure Cultures from Plant Root Exudates J. Agr. Sci. Tech. ; 14: 985-994. 69. Mehran M., Ardakani MR, Madani H., Zahedi M., Amirabadi M., Mafakheri S. (2011) Response of Sunflower Yield and Phytohormonal Changes to Azotobacter, Azospirillum, Pseudomonas and Animal Manure in a Chemical Free Agroecosystem Annals of Biological Research;2(6):425-430. 70. Mehnaz S., Weselowski B., Lazarovits G.: (2007) Azospirillum zeae sp. nov., a diazotrophic bacterium isolated from rhizosphere soil of Zea mays. Int. J. Syst. Evol. Microbiol.;57:2805-2809. 71. Mehnaz S., Weselowski B., Lazarovits G.: (2007) Azospirillum canadense sp. nov., a nitrogen-fixing bacterium isolated from corn rhizosphere. Int. J. Syst. Evol. Microbiol. ; 57, 620-624. 72. Molina-Favero C., Creus CM, Simontacchi M, Puntarulo S., Lamattina L (2008) Aerobic Nitric Oxide Production by Azospirillum brasilense Sp245 and Its Influence on Root Architecture in Tomato MPMI ; 21 (7) :1001-1009. 74. Moirera F.M.S., Lange A., Kauberg â€“filho O., Siquera J.O., Nobrega R.S.A., Lima A.S. (2008) Associative diazotrophic bacteria in grass roots and soils from heavy metals contaminated sites Annals of the Brazilian Academy of Sciences ;80 (4): 749-761. 75. Mora P.â€¢Rosconi F., Fraguas LF.,â€¢Castro-Sowinski S. (2008) Azospirillum brasilense Sp7 produces an outer-membrane lectin that specifically binds to surface-exposed extracellular polysaccharide produced by the bacterium Arch Microbiol 189:519â€“524 . 76. Naiman A.D., Latronico A., GarcÄ±a de Salamone InÃ©s E. (2009) Inoculation of wheat with Azospirillum brasilense and Pseudomonas ï¬‚uorescens: Impact on the production and culturable rhizosphere microï¬‚ora. Eur J Soil Biol ;45:44â€“51. 77. Okon Y. Labandera Gonzales C., Lage M., Lage P.(2015) Agronomic application of Azospirillum and other PGPR in de Brujin F.(ed) Biological Nitrogen Fixation John Wiley &Sons . 78. Ogar A., Sobczyk L., Turnau K, (2015) Effect of combined microbes on plant tolerance to Znâ€“Pb contaminations Environ Sci Pollut Res; 22:19142â€“19156. 79. Pedraza R.O., Motok J, Salazar S.M., Ragout A.L., Mentel M.I., Tortora M.L., Guerrero-Molina M.F., Winik B.C., DÄ±az-Ricci J.C. (2010) Growth-promotion of strawberry plants inoculated with Azospirillum brasilense. W J Microbiol Biotechnol 26:265â€“272. 80. Peng G., Wang H., Zhang G., Hou W., Liu Y., Wang E.T., Tan Z.: (2006) Azospirillum melinis sp. nov., a group of diazotrophs isolated from tropical molasses grass. Int. J. Syst. Evol. Microbiol. ;56, 1263-1271. 82. Pereyra M.A, GarcÃ­a P., Colabelli M.N., Barassi, C.A., Creus C.M. (2012) A better water status in wheat seedlings induced by Azospirillum under osmotic stress is related to morphological changes in xylem vessels of the coleoptile Applied Soil Ecology; 53:94 â€“97. 83. Perrig D., Boiero M.L, Masciarelli O.A., Pena C., Ruiz O.A., Cassan F.D. Luna M.V. (2007) Plant grow promoting coumpounds produced by two agronomicaly importants strains of Azospirillum brasilense and implication on inoculant formulation. Appl. Microbiol. Biotechnol. ;75: 1143-1150. 84. Reinhold B., Hurek T., Fendrik I., Pot B., Gillis M., Kersters K., Thielemans S., De Ley J.: (1987) Azospirillum halopraeferens sp. nov., a nitrogen-fixing organism associated with roots of kallar grass (Leptochloa fusca (L.) Kunth). Int. J. Syst. Bacteriol. ; 37:43-51. 85. Rout M.E., Southworth D., (2013) Rhizosphere interactions, the root microbiome influences scales from molecule to ecosystems- the unseen majority Am J Bot.;100(9):1689-91. 88. Srinivasulu M., Mohiddin G.J., Madakka M., Ramgaswamy V. (2012) Effect of pesticides on the population of Azospirillum sp. and on ammonification rate in two soils planted to groundnut (Arachis hypogaea L.) Tropical Ecology ;53 (1): 93-104. 89. Schoebitz M., Mengual C., RoldÃ¡n A. (2014) Combined effects of clay immobilized Azospirillum brasilense and Pantoea dispersa and organic olive residue on plant performance and soil properties in the revegetation of a semiarid area Science of the Total Environment; 466â€“467 (2014) 67â€“73. 91. De Smedt, M. Bauwens, R. Tytgat, and J. De Ley (1980) Intra- and Intergeneric Similarities of Ribosomal Ribonucleic Acid Cistrons of Free-Living, Nitrogen-Fixing Bacteria Plant growth promotion by Azospirillum sp. in sugarcane Int J Syst Bacteriol ;30:106-122. 92. Suhail M., Mahdi I.A. (2011) Response of Azospirillum brasilense Bacteria to the Types and Concentrations of Different Salts Bulletin USAMV Agriculture; 68 (1):356-362. 93. Tarrand J.J., Krieg N.R., DÃ¶bereiner J.:(1978) A taxonomic study of the Spirillum lipoferum group, with descriptions of a new genus, Azospirillum gen. nov. and two species, Azospirillum lipoferum (Beijerinck) comb. nov. and Azospirillum brasilense sp. nov. Canadian Journal of Microbiology ;24, 967-980. 94. Tahir M., Mirza M.S., Zaheer A., Dimitrov M.R., Smidt H. and Hameed S. (2013). Isolation and identification of phosphate solubilizer Azospirillum, Bacillus and Enterobacter strains by 16SrRNA sequence analysis and their effect on growth of wheat (Triticum aestivum L.). Australian Journal of Crop Science;7(9): 1284-1292. 95. Tortora M.L., DÃ­az-Ricci J.C., Pedraza R.O. (2012) Protection of strawberry plants (Fragaria ananassa Duch.) against anthracnose disease induced by Azospirillum brasilense Plant and Soil;356(1) :279-290. 96. Trabelsi D., Mhamdi R. (2013) Microbial Inoculants and Their Impact on Soil Microbial Communities: A Review BioMed Research International; 2 Article ID 863240, 11 pages http://dx.doi.org/10.1155/2013/863240. 98. Vettori L., Felici C., Russo A., Morini S., Cummings S., Toffanin A. (2010) Biocontrol activity of Azospirillum brasilense Sp245 against Rhizoctonia solani by in vitro/in vivo tests, DGGE analysis. Journal of Biotechnology, 150. p. 503. ISSN 01681656. 99. Veresoglou Stavros D. Menexes G. (2010) Impact of inoculation with Azospirillum spp.on growth properties and seed yield of wheat:a meta-analysis of studies in the ISI Web of Science from 1981 to 2008. Plant Soil; 337:469â€“480. 100. Venieraki I., Kefalogianni I., Pergalis P., Chatzipavlidis I, Dimou M., Katinakis P. (2008) Isolation of Azospirillum and Pseudomonas, diazotrophs from wheat rhizosphere in Greece Proc Natl Acad Sci 105,7564-9. 101. Vessey (2003) Plant growth promoting rhizobacteria as biofertilizers. Plant Soil;25 557 1-586. 102. Wang Q, Quensen JF, III, Fish JA, Lee TK, Sun Y, Tiedje JM, Cole JR. (2013) Ecological patterns of nifH genes in four terrestrial climatic zones explored with targeted metagenomics using FrameBot, a new informatics tool. mBio 4(5):e00592-13. doi:10.1128/mBio.00592-13. 103. Wang YP., Chen N.L., Wang R.M., Xiong Y.B., Zha R.T. (2004) Preparation of a multifunctional bacterial fertilizer by living azospirillum simplex cells immobilized on poly (sodium acrylate) Polym. Adv. Technol. 15: 81â€“83. 104. Walker V., Bertrand C., Bellvert F, Moenne-Loccoz Y., Bally R., Comte G. (2011) Host plant secondary metabolite proï¬ling shows acomplex, strain-dependent response of maize to plant growth-promoting rhizobacteria of the genus Azospirillum New Phytologist189: 494â€“506. 106. Xie C.H., Yokota A.: (2005) Azospirillum oryzae sp. nov., a nitrogen-fixing bacterium isolated from the roots of the rice plant Oryza sativa. Int. J. Syst. Evol. Microbiol., 55, 1435-1438. 107. Yang J, Kloepper JW, Ryu C-M (2009) Rhizosphere bacteria help plants tolerate abiotic stress. Trends Plant Sci 14(1):1â€“4. 108. Young C.C., Hupfer H., Siering C., Ho M.J., Arun A.B., Lai W.A., Rekha P.D., Shen F.T., Hung M.H., Chen W.M., Yassin A.F. : (2008) Azospirillum rugosum sp. nov., isolated from oil-contaminated soil. Int. J. Syst. Evol. Microbiol. ; 58, 959-963. 110. Zhou Y., Wei W., Wang X., Xu L., Lai R. (2009) Azospirillum palatum sp. nov., isolated from forest soil in Zhejiang province, China J. Gen. Appl. Microbiol. ;551-7.